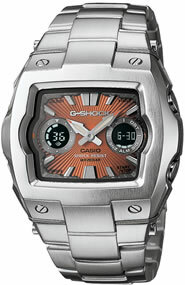 After years of success with its line of G-Shock timepieces, Casio introduces a new look for its famous line. This new and fashionable line consists of seven models that embody the same legendary G-Shock toughness with a stylish, new analog/digital design. These stylish Ana-Digi G-Shock watches combine the best of both analog and digital timekeeping, so they’re not only fashionable, but functional. Employing 27-city world time (29 time zones), auto LED light, countdown timer, stopwatch and 5 alarms, these watches are not only high fashion, but high tech as well.The new Casio G011 series combines a fashionable square dial with a large forged metal bezel and back cover. Along with the trendy new look, these G-Shocks are as tough as their predecessors. The watches are shock-resistant and water-resistant up to 200 meters. The new Casio G011 models come in a variety of six stylish dial colors including: black, blue, copper, purple, white and silver. The Casio G011BD model features a black face and a gold ion plated watch case and band. The G011 series will be available March 2007 for $150 at select Macy’s locations in USA.